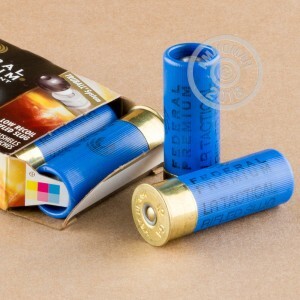 If you want to extend the reach of your 12 gauge shotgun without turning to hard kicking hunting loads, try this ammunition from Federal Tactical. These shells fire slugs and achieve superior accuracy with Federal's Truball system, which uses an economical but effective plastic ball to center the slug in the bore for more consistent ballistics. Each shell in this case of 250 fires a one-ounce rifled slug at a muzzle velocity of 1,300 feet per second. The relatively low velocity of this load results in more manageable recoil and a higher rate of aimed fire without sacrificing much close to medium range performance. This ammo is designed to stop assailants without overpenetration (as a hunting load might) and risking harm to bystanders or property. This ammunition is proudly made in the USA by Federal, a division of the Vista Outdoor group. Federal's main production facility is located in Anoka, Minnesota, where the company was founded in the 1920s. Pick up this case or any items totaling $99 or more to get free shipping from AmmoMan.com! 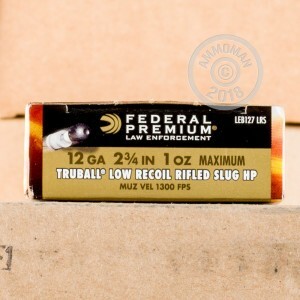 Perfect Low recoil slugs, perfect for target practice. The low reciol makes shooting a shotgun fun without getting into a world of hurt. Premium slugs with high accuracy. I Highly recommend these rounds. Great Ammo. This has less recoil so it is great for a police academy setting and tru slug lets you be accurate with your shot. This ammo is hard to find but thankfully ammoman has it in stock!